Geneva is not a Sunday-city but fortunately the Marché de Plainpalais makes it alive! When it looks like nobody is in the street, you will find many people on the plaine de Plainpalais in a lively atmosphere. 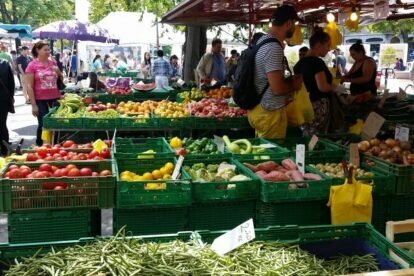 The Marché de Plainpalais also takes place on Tuesday and Friday morning but on Sunday, during the whole day, the market is the place to be to buy vegetables, fresh food and clothes, to meet people or to have a snack and a drink. For a couple of years the Marché de Plainpalais has been constantly developing and always gathers more people and food trucks. It is a real melting pot. There is food from all over the world, people come from many countries, speak many different languages and are from all socio-economic levels. You meet old and young people, people coming to buy their Sunday roast chicken or their weekly vegetables. Prices depend on the stand: at organic producers’ stands the vegetables are tasty, seasonal but expensive, at resellers’ the quality is lower and usually from abroad, but incredibly cheap, even cheaper than at the supermarket (e.g. in summer you can find 1kg Tomato for CHF 1. – !!! ).